The dining room is a space you usually set a formal or serious mood at. It is a space where you want to exude elegance and refined touches as much as possible. This is because of the fact that a lot of socialization happens in this area of the house. It is where gatherings take place where your friends and family enjoy a good meal and good conversation. It is also the most sensible space to decorate a little more proper and polished compared to the rest of your home that is why it is the part of the home that gets the most attention to, right? You tend to focus on giving it a bit of an uptight yet inviting vibe. Let me ask you this, have you ever wondered how would it be like if your dining space has a laid-back vibe to it? If I tell you that you can still make it sophisticated and stylish while at the same time giving you an easy-going mood, would you be willing to try it? The ideas in decorating your home space are endless! You can have fun decorating and create that inviting vibe that you have always wanted in your dining space without being confined to the rules you have always used. Imagine how it would feel if you take a step back and redecorate your home without playing by the book. Let me tell you it would really feel great! Every touch of decor you will incorporate to it will be your own and it will echo your own personal style. If you are gearing towards a style with no limitations only creativity and individuality then Bohemian dining room style is the one for you. It is whimsical, dreamy, casual, chic and of course eclectic. It is a space design where a mismatched décor is nothing but charming. It embraces nature that is why organic decor is one of its key component making it a lot more refreshing and so inviting. If you want to know more of this wonderful design and is in need for some inspiration then read on to see a list of 20 Enchanting Bohemian Dining Room Designs we have gathered for you. 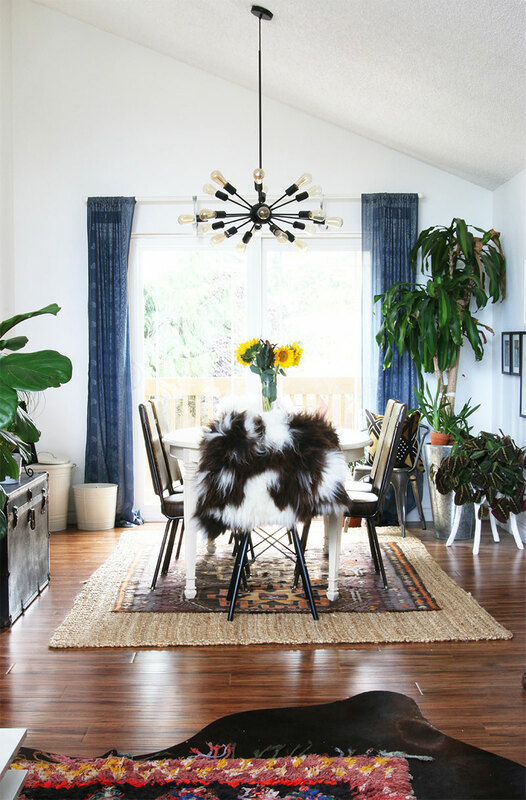 This modern-bohemian dining room design is so chic and refreshing. The black and white ikat stripe rug gives a hippie, edgy look. 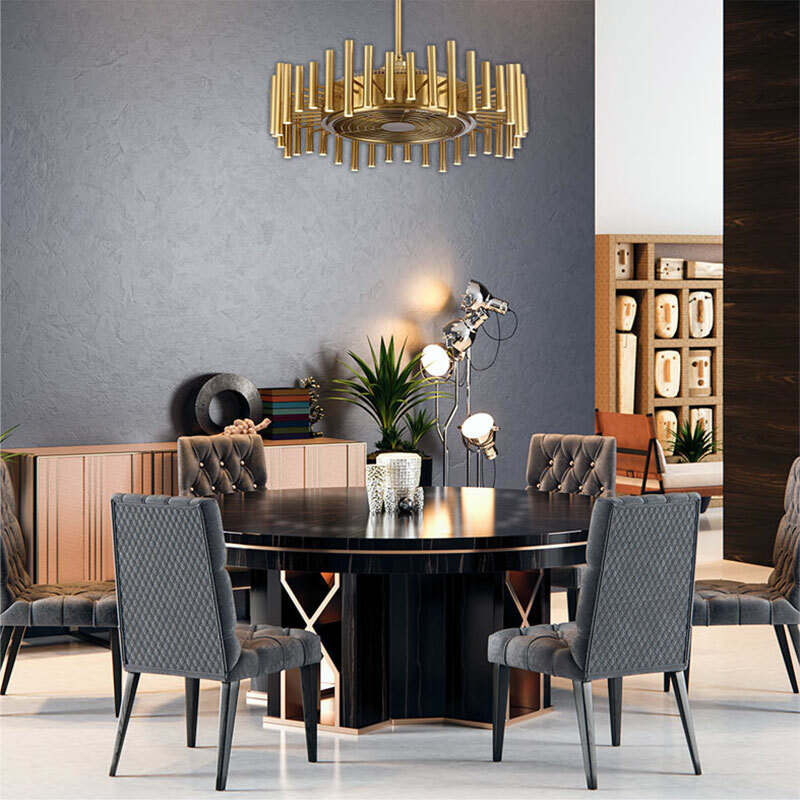 The brass accents on the lanterns and chandelier and the round mirror with black thin frame bring clean lines and modern look while the leather chairs with metal legs and bold stitching details add a charming rustic vibe. This is a perfect combination of modern and Boho chic look. If you are looking for a glam bohemian look in your dining space, this look is the one for you. The hotel chic furniture and decor blends perfectly with unexpected touches of bold, eclectic decor that is both casual and glamorous. The brushed copper chandelier ceiling fan gives off an elegant punch with fun geometric flair. This dining space brings happy mood and summery feels. 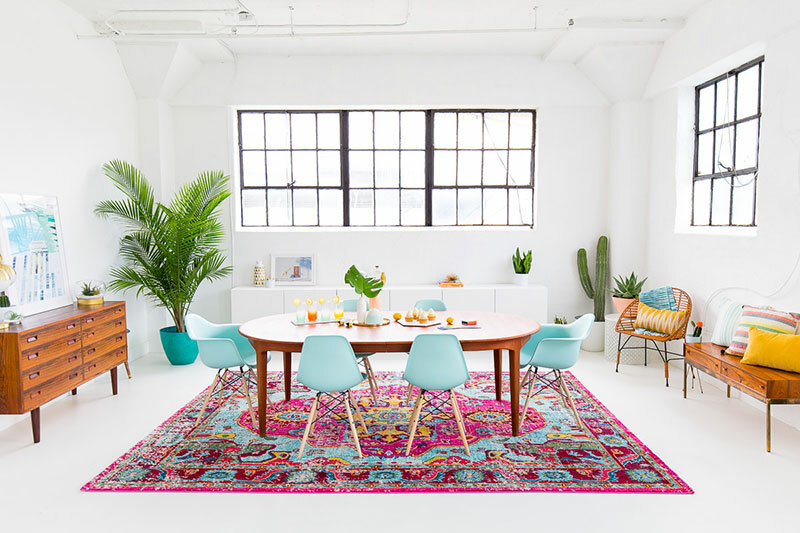 The lovely touches of bright, cheery pastel colors that you can see on the area rug, chairs and throw pillows bring a youthful, hippie vibe. The pops of green and wood tones on this white dining space give that inviting and refreshing feel. Alright, yes, you got me! This is a breakfast nook and not really a dining room but for those who have a limited space, breakfast nooks can double as a dining space. 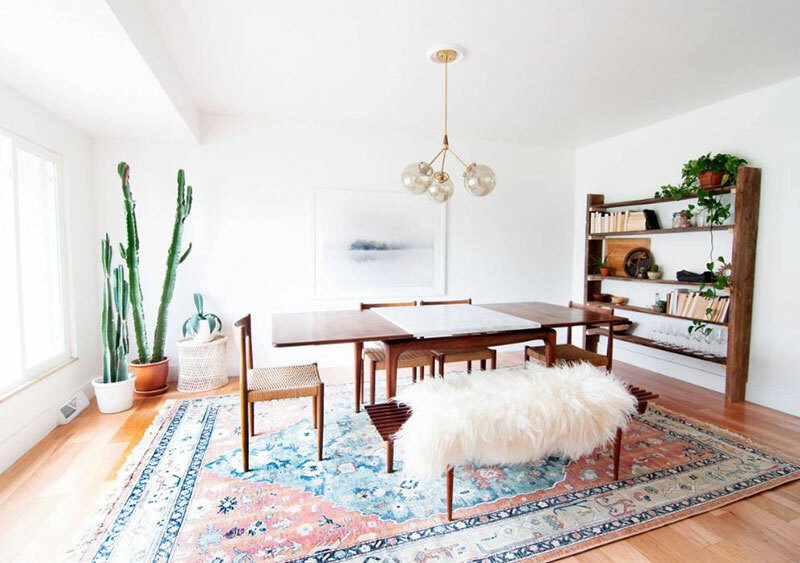 You can be all out having a formal touch on your dining space or have it cozy and casual like this beautiful bohemian space. Look at those playful patterns and lively colors that liven up this space! 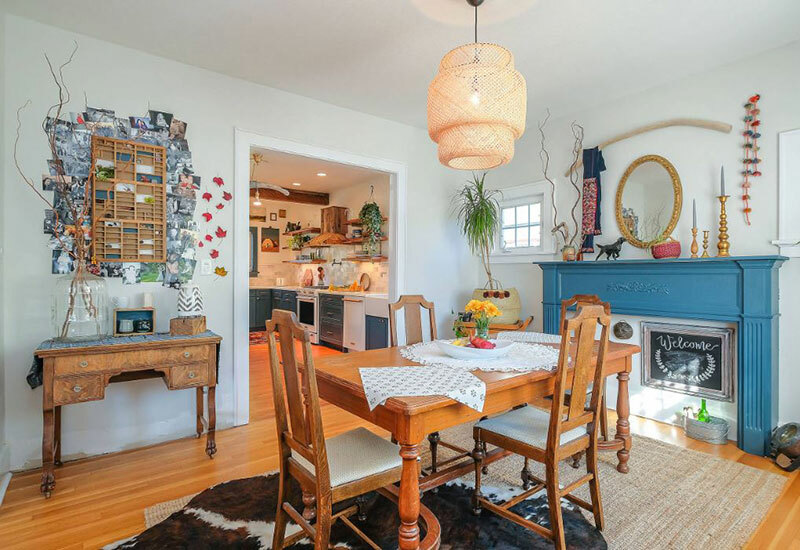 It exudes a happy and inviting vibe that is both casual and charming. I love how organic elements work in this dining space! The Pop & Scott Feathertop table with an oversized potted plant on it takes the spotlight. Drum stools in different colors, carved stumpies and chair bring a stylish and refreshing look that is both eclectic and rustic. This dining space has a taste of everything! The integration of books in a dining space is a great way to fill a blank wall and at the same time very functional for bookworms. 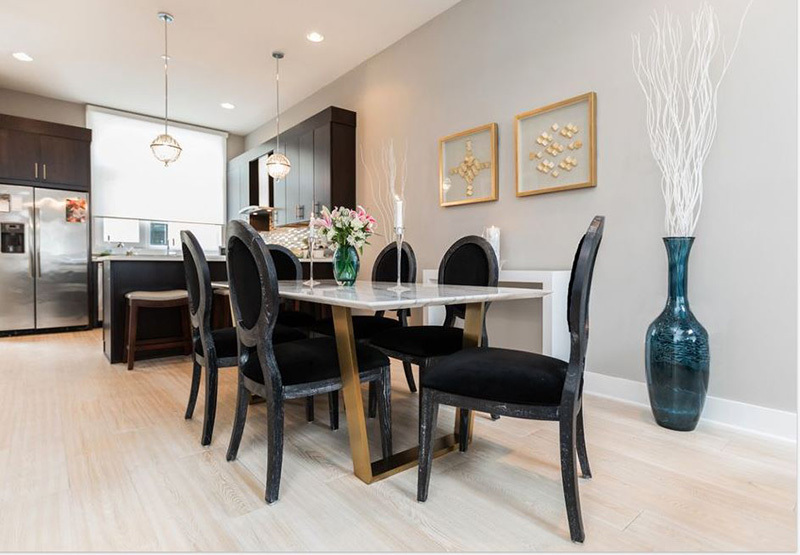 It has the glamour of modern touch on its beautiful pendant chandelier and sheep’s skin throw on the bench and an inviting vibe of rustic flair that you can see on the wood furniture and flooring. The area rug with its lovely patterns and colors adds interest to the whole scheme. The oversized cacti give a visual impact while balancing the warm wood hue on the space. I love how all these different elements come together and created this whimsical dining room! The unexpected pop of color on the mantelpiece is a charming, bold punch to the space. 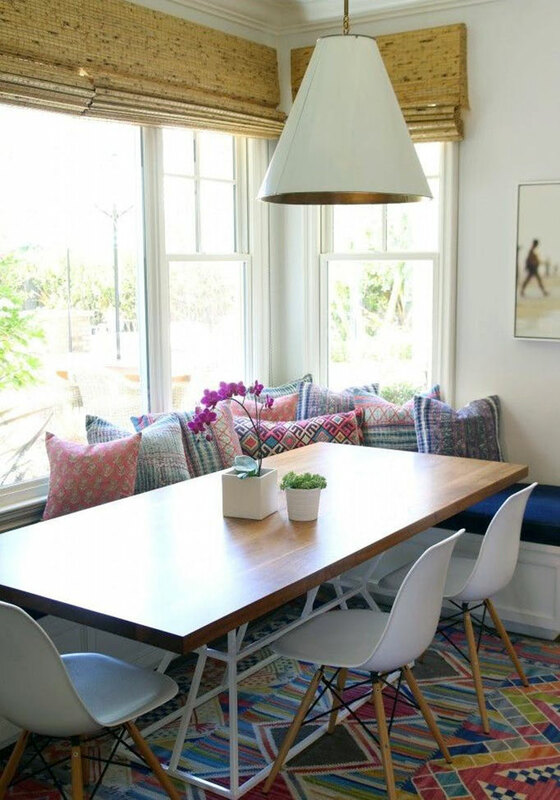 This gorgeous dining space is layered with beautiful textures and playful patterns. 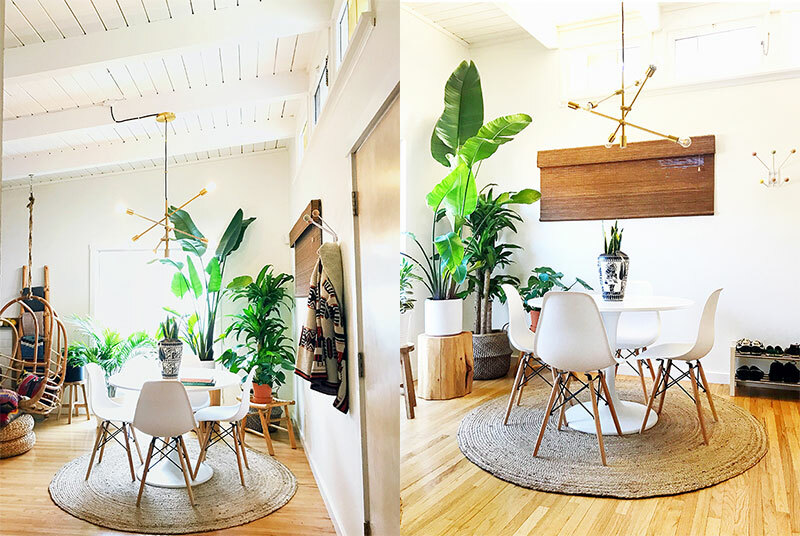 The oversized plants make this room a lot more inviting, calm and fresh. The pendant chandelier adds an industrial, modern touch that balances the vintage, eclectic look. 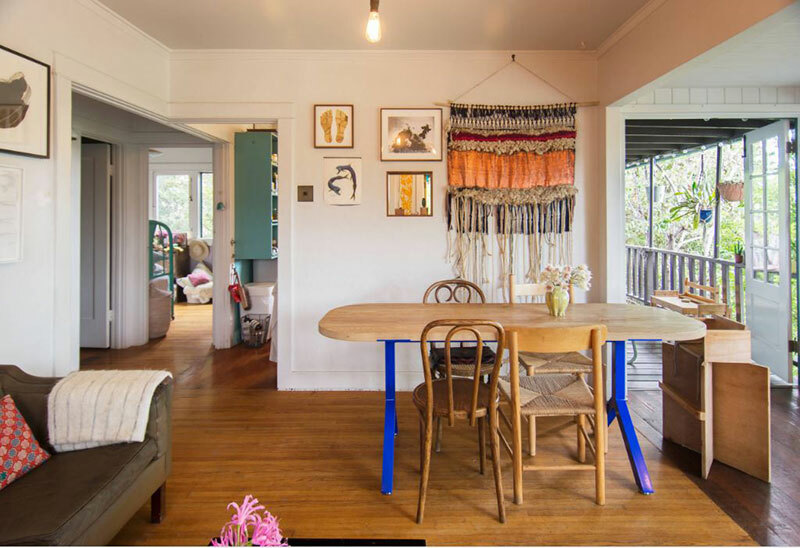 Hanging tapestry is a common decor in bohemian-inspired spaces. In this dining room, the hanging tapestry that has been woven from raw wool, cotton, copper tape and sisal rope creates a unique accent and interest together with the rest of the wall art display against the white wall. It also gives a hippie vibe to the space. The mismatched chairs and the striking blue legs of the dining table add fun and eccentric flair to it. There might be a lot going on, on this dining space yet all the unique elements manage to pull it off and come out stunningly. The lovely wallpaper with its cheery mood and warm colors blended magically with the oversized plants and dining space decor. The room is full of lavish texture, beautiful patterns and exciting pop of colors and the white elements help in balancing it out. 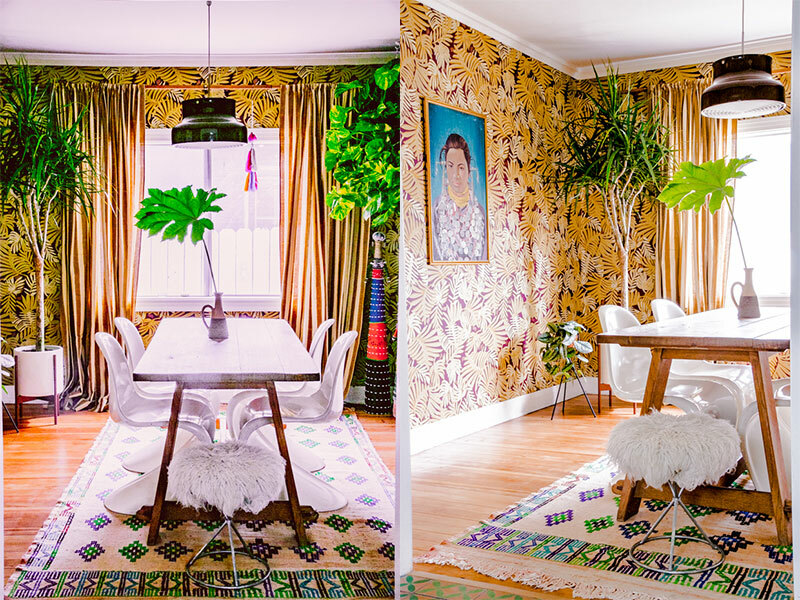 This space is one daring and fun bohemian-inspired dining room! 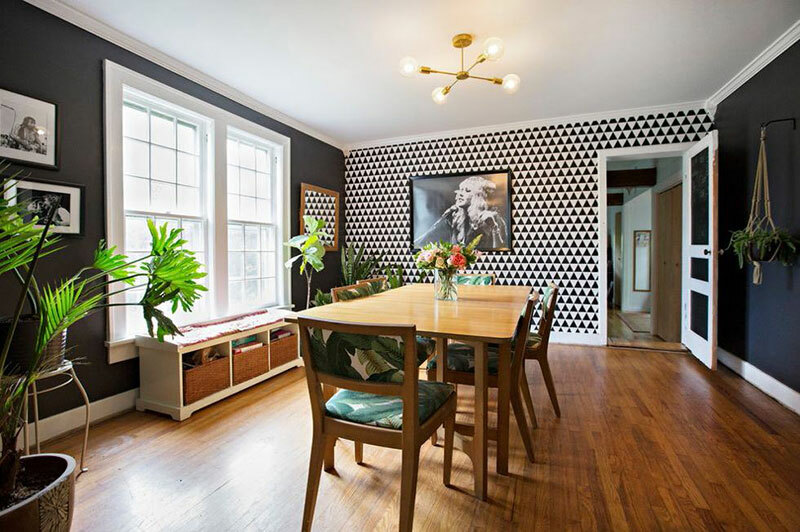 Its featured wall is accentuated with bold patterned black-and-white Eijffinger wallpaper and framed black-and-white framed photographs. The black-and white-scheme is broken with the playful patterns and colors of the iconic Tommy Bahama print on the dining chairs’ covers as well as the plants around the area. 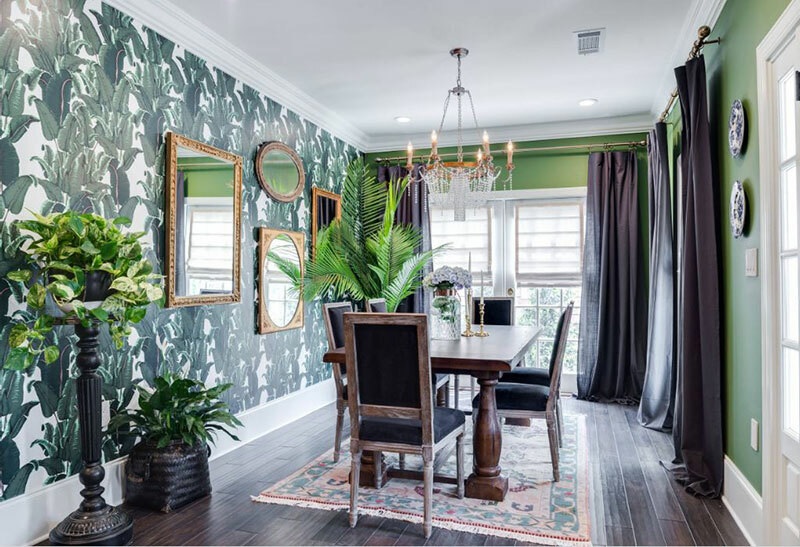 The dining space features a focal wall with striking leaf pattern wallpaper in green and white and framed mirrors in different sizes that create depth. The drapes in dark shade provide a bold statement that adds drama to this grand-bohemian dining room design. Branch serving as a hanger for the wall accent – tapestry, is a good way to go if you are one who is more likely does not want to commit to having used one design for a long time. You can change your wall accent anytime when you feel like it just by changing your tapestry. I also love the < href=”https://homedesignlover.com/home-accesory/geometric-pastel-modern-throw-pillows/”>throw pillows with playful patterns and unexpected textures adding personality and comfort to this space. The stylish dining table with fringe covering adds a Boho-chic vibe while the clear dining chairs and round area rug gives off a modern flair. One of the key components of bohemian design is to showcase art and the adventures of each and every travels you have had. If you are into traveling and you are fond of collecting souvenir from the places you go to, then you may take a cue from this amazing dining room design. 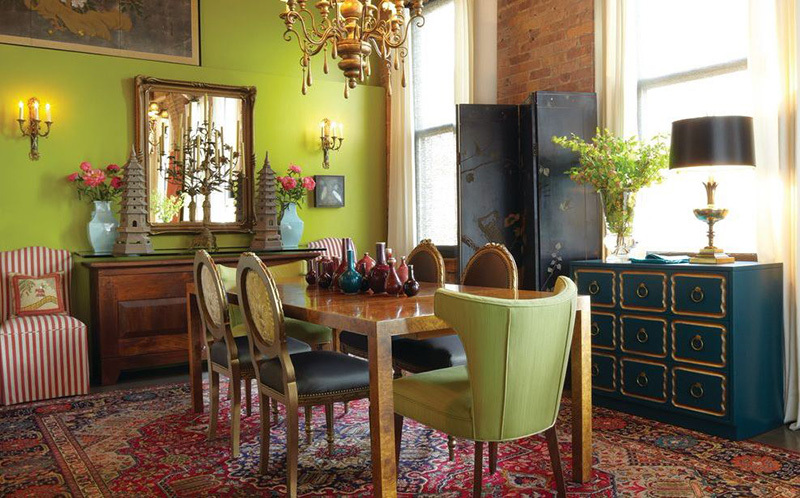 It is an eclectic beauty that highlights on worldly decor and furnishings. 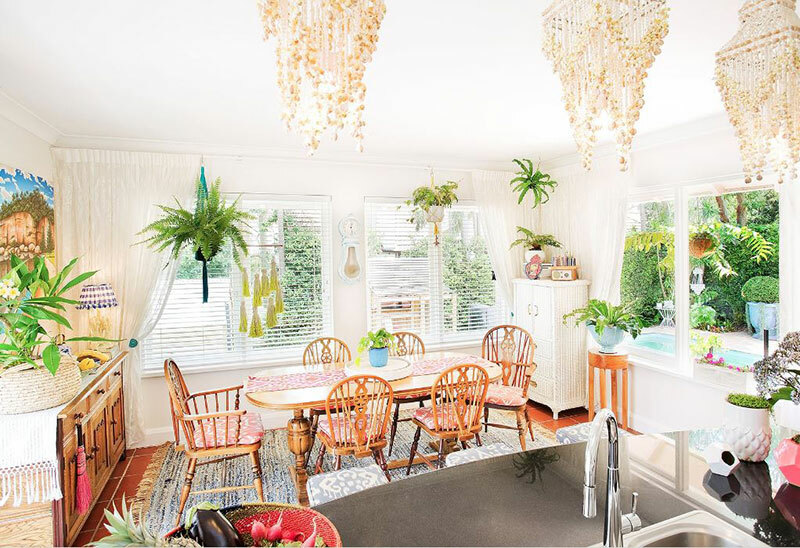 One look at this dining space and it will give you the feeling of joy and summer vibe. It has a bright and airy atmosphere that makes it welcoming. 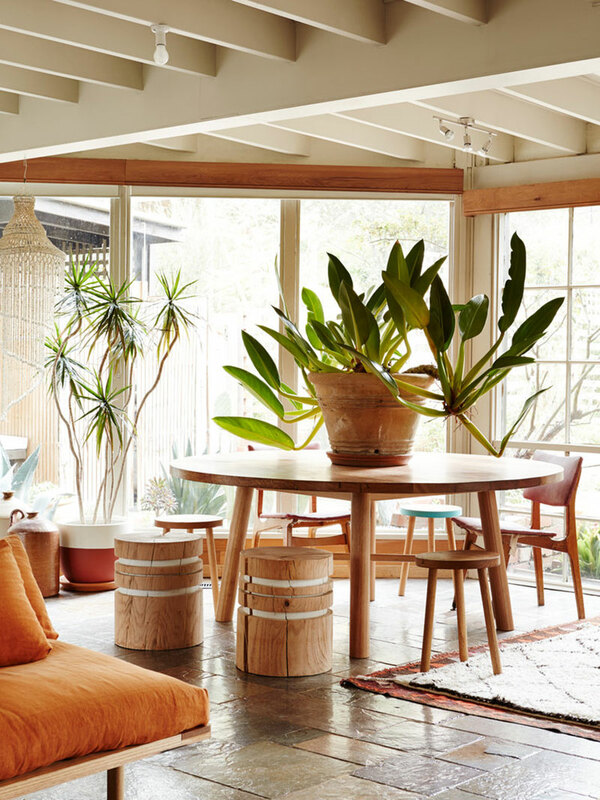 The plants in different heights lift the brightness and warm wood tones in this space. I love everything in this dining space! The wood accent on the wall and on the decor around beautifully complements with the white elements. 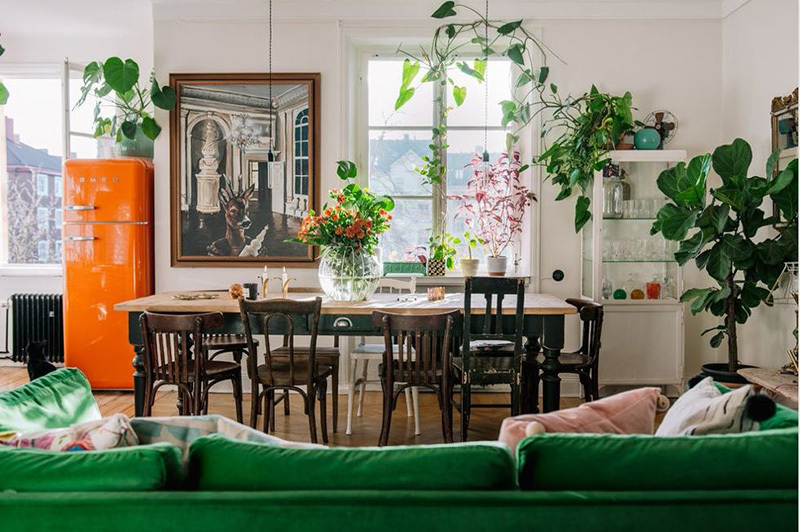 The pop of greens from the oversized plants creates a vertical illusion drawing the eyes upward giving the space height and a fresh and calming feel. I love the black velvet chairs in distressed black oak that gives drama and personality to this beautiful open dining space. This bohemian-inspired dining room is a combination of eclectic and modern touches that presents a sophisticated look and layers of rich textures. 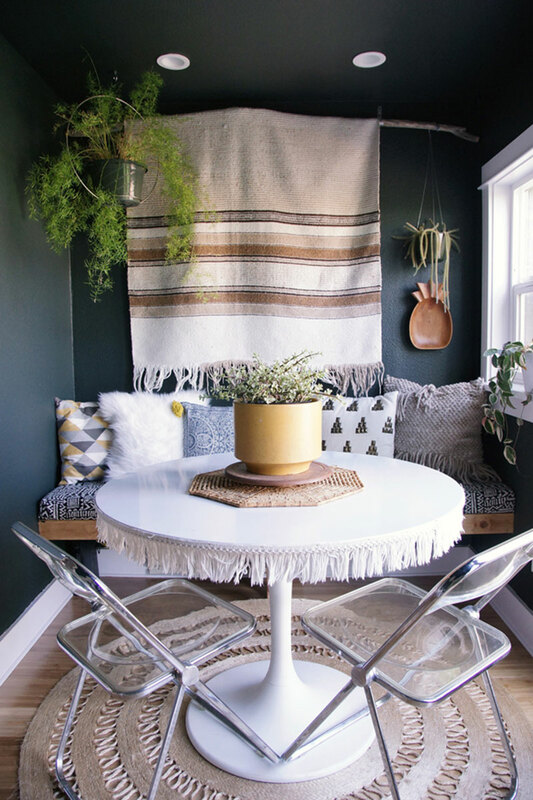 This bohemian dining space is so laid-back. 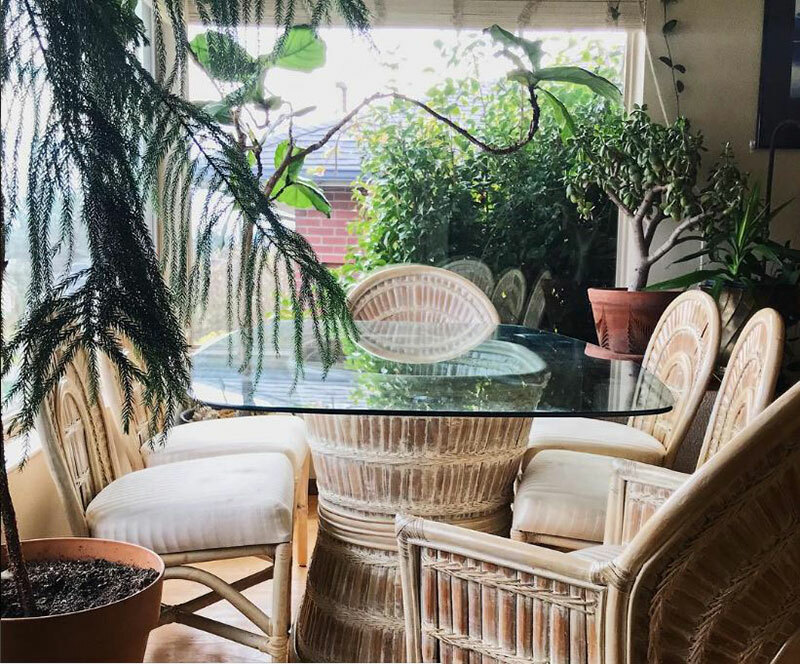 I love the wicker dining set that sets a casual and easy vibe. The plants in different shapes and sizes give off a whimsy look that is inviting and charming. 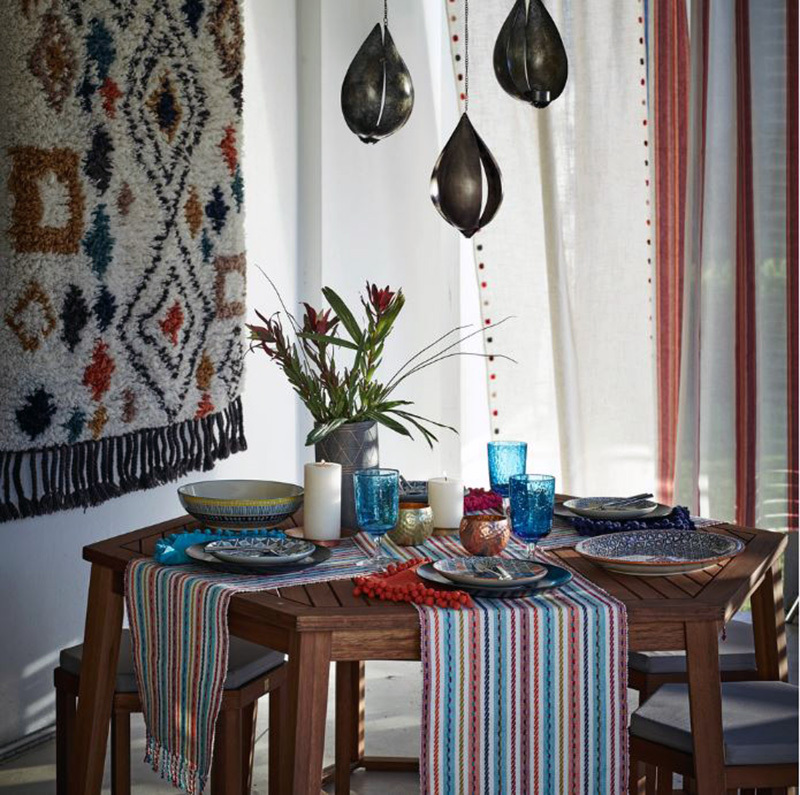 The globally inspired prints and colors dominate this free-spirited dining space. Look at how all these bold elements standing out on its own come together wonderfully! This room is all about eccentricity. Rich textures coming from mismatched dining chairs and a lovely dining table making it so appealing and interesting. The pop of exuberant colors and unique decor create a lively and exciting mood that is comforting and enchanting at the same time. I had so much fun creating this list for you. I hope you enjoyed reading and looking at those incredibly done bohemian dining spaces as much as I did. The wonderful effect of plants in different colors, shapes, and sizes are whimsy and invigorating. I love how unexpected decor and furnishings could pull off a charming, cohesive look. The laid-back vibe and casual feel of a bohemian space could be done even in the most formal setup you could imagine, like the dining room. All it takes is for you to loosen up and let the free-spirited Boho designer in you do the magic.